Need to Vent! — Movie Reviews with a Twist: MOVIE SMACKDOWN! "Had enough of Obama vs. Clinton? Watch films do battle instead. At Movie Smackdown! two films go toe-to-toe to decide whether the defending champion, a classic, still has what it takes, or if a new release is the one to watch." This quote is the opening paragraph on the American Movie Classics (AMC) website announcing that Bryce Zabel's Movie Smackdown! has been selected as their "Website of the Week." With AMC available in over 92 million homes this prestigious designation is extremely significant and, we believe, one that is well deserved. The entire staff at Needtovent sends our congratulations to Bryce and to all of the other Guest Reviewers who help make this website so successful. As loyal readers of this blog already know, Needtovent's very own Robert A. Nowotny is proud to be an occasional contributor to Movie Smackdown! and so, in celebration of the recognition bestowed by AMC, we are posting below a "Smackdown!" that Robert wrote just a day or two before the AMC announcement. The Passion of the Critic or the Critic of the Passion? The Smackdown. A few years ago, as the story has been passed down to believers, a great prophet named Gibson proved that religion was not poison at the box office. Gibson begat Stein who walked in the sandals of Moore into the desert determined to prove that Gibson's Law would apply to Documentaries. Half-baked metaphors aside, clearly the King of all (movie) Kings is Mel Gibson's "The Passion Of The Christ." While this enormously successful film was as much a cultural and theological phenomena as a cinematic one, there's no question it struck a responsive chord with millions of Christians worldwide. Now, four years later, there is another movie that has deep religious undertones and a swirl of controversy surrounding it -- Ben Stein's "Expelled: No Intelligence Allowed." Can prophet Stein match prophet Gibson when it comes to turning the Meek loose on the Earth? Will "Intelligence" trump "Passion?" The Challenger. "Expelled: No Intelligence Allowed"
"Expelled" follows Ben Stein as he seeks to determine whether religious-based Intelligent Design is a pseudo-science trying to undermine evolutionary biology or whether it is legitimate science being suppressed by a scientific establishment that is hostile to any deviation from the status quo. Good question, but as they say in Hollywood, it's all about the execution. Stein is a former White House speechwriter under the Nixon Administration, probably better known for his droll wit on "Win Ben Stein's Money." First-time director Nathan Frankowski works with two neophyte screenwriters with only one previous credit between them, Kevin Miller and Walt Rulof, and, of course, Stein as the religious right Michael Moore. Maybe the film should have been called "No Experience Allowed." Anyway, there are a few head-scratchers in this film, probably topped out by the time Stein and his camera crew visit Hitler's concentration camps and ill-advisedly correlate Darwinism to Fascism and Nazi Germany. As long as I'm giving advice on film marketing, maybe they could try "Stein Kampf" for the DVD release. Give Herr Stein credit, he certainly doesn't pull any punches when it comes to being vitriolic -- even the most stalwart Bible-belt Baptist may find this analogy harder to swallow than Jonah. The Defending Champion. 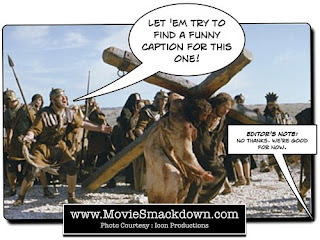 "The Passion of the Christ"
Remember the old Spaghetti Westerns of the 1960s? Mel Gibson certainly does, based on this religious opus which could have been titled "A Fistful of Floggings." (Note to Distributors: My re-titling services are available at a reasonable fee.) As the lead, James Caviezel certainly has the right physical look and the emotional intensity to take on a seemingly never-ending series of horrific flailings and beatings. This is a hard film to watch, seeing anybody (but especially Jesus) endure this kind of on-screen cruelty. Still, there is no dispute that it made "The Passion Of The Christ" a powerful movie-going experience for millions and millions worldwide. This, despite a screenplay by Benedict Fitzgerald and Mel Gibson himself that arguably has no plot, no plot points and no character arcs. As a result, there's not all that much you can hang your shroud on. Still, there's no denying that "Passion" succeeded despite a bevy of filmmaking flaws -- sometimes such details as cheesy sets, a cartoon-like moon in the opening scene (think a Basil Rathbone film) and Jesus sporting a silver filling on his right molar simply don't matter. Talk about a "miracle." The Scorecard. When it comes to commercial success and box office results, the scorecard is not yet determined, although betting on Mr. Ed to win the Kentucky Derby would have better odds than to believe "Expelled" will come anywhere close to approaching the numbers run up by "Passion." Both films, at least in this reviewer's opinion, are flawed due to a wide variety of production issues that, quite frankly, are more than appalling. Having said this, "Expelled" certainly goes beyond being bold in presenting its case on behalf of Intelligent Design. In addition, the film has a far more complex subject matter so it deserves extra consideration. The climax of "Expelled," for example, features Stein going head-to-head with Richard Dawkins, a renowned atheist and author. It really doesn't matter which side you're on, both of these guys are undeniably intelligent, and it raises issues. 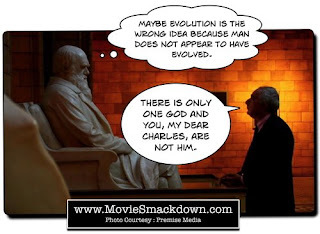 By the way, this film doesn't spend that much time focused on the details of the debate between evolutionists and creationists. Instead it really focuses on the key thesis that the debate itself and its Intelligent Design proponents have been ignored or pushed out of classrooms and academia. In a country that still believes in the First Amendment, this is at least something worth thinking about, even if you think the other side has their head in an anatomically incorrect place. The Decision. "The Passion Of The Christ" had as much "passion" as the average Ron Jeremy flick. Never once did I get the feeling that Caviezel's Jesus was someone special or divinely spiritual -- his flashback scenes with his disciples and followers yielded nothing beyond a perfunctory delivery of the screenplay's rudimentary dialogue. Heck, I've been to Tupperware parties where the speaker held my interest better. On the other hand, "Expelled" feels like such a total mess that it's clear that the arguments for Intelligent Design are way beyond the capability of being articulated by Ben Stein and his gang of religious bullies. Maybe Alan Shore could do the trick. Until then, the only "intgelligent design" I know of comes from Ron Popeil and his creations at Ronco. The winner, by a landslide, is Melodrama Mel and "The Passion Of The Christ." Other Smackdowns! by Robert A. Nowotny include "The Mist" (2007) vs. "The Fog" (1980) and "The Bucket List" (2007) vs. "Bubba Ho-Tep" (2002). Ben(jamin) Stein with his 'Expelled' is under heavy artillery for 'exaggerating' or 'going easy' on the influence of evolutionism behind Nazism and Stalinism (super evolution of Lysenkoism in the Soviet Russia). But the monstrous Haeckelian type of vulgar evolutionism drove not only the 'Politics-is-applied-biology' Nazi takeover in the continental Europe, but even the nationalistic collision at the World War I. It was Charles Darwin himself, who praised and raised the monstrous German Ernst Haeckel with his still recycled embryo drawing frauds etc. in the spotlight as the greatest authority in the field of human evolution, even in the preface to his Descent of man in 1871. If Thomas Henry Huxley with his concept of 'agnostism' was Darwins bulldog in England, Haeckel was his Rotweiler in Germany. Haeckel was also the first one to propose a systematic answer to the Judenfrage: To EXPEL all the Jews from their chairs at the universities. You certainly did an excellent job in analyzing the various aspects of both movies. To a large extent, both movies require an personal relationship with the author to grasp many of the points being made. that in and unto itself is a weakness itself and provides sufficient ammo to many of the detractors. The Passion of Christ personalized for many the suffering that Jesus went through and for some provided a more present day picture that may allow them to gain some comfort. On the other side, Expelled was a "Z" budget movie and while I like the concept of the controversy I too felt it left much to be desired in all aspects. Again it does raises the specter of a thought to contemplate and while it was inept, alas there are many who may actually ponder the questions or issues raised by the film or the critics. Overall, to translate a spiritual issue into a cinematic marvel when the industry clearly emphasizes commercial success is setting unrealistic goals. As you know sometimes one must pursue what you feel is right for reasons that may become clear someday. While I have my doubts about Expelled, Mel Gibson's movie, a drastically bold step out, will in my opinion be around for some time and will be in more and more DVD collections. Congrats to Movie Smackdown it is wonderfully informative and entertaining venue.